A collection of essays on the search for the ultimate reality beneath the narrative of our lives. We all define our lives through the lens of stories. Whether we see ourselves as heroes or victims, good people or bad, everyone lives according to interwoven strands of narrative. Drawn from intimate, deep-dive talks, The Most Important Thing presents writings devoted to the search for the ultimate reality of a self that exists beyond the bounds of storytelling. Here you will find vivid anecdotes and teaching stories that illuminate the felt experience of Adyashanti’s teachings—those moments of grace in which every stone, tree, ray of light, and fraught silence reveal that none of us is alone and no one is ever truly isolated from the whole of existence. What is the story of your life? Is it happy or adventurous? Sad or lonely? 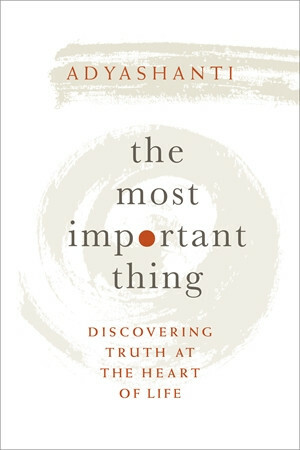 In The Most Important Thing, Adyashanti shows you how to look past your personal narratives, delve inward, and connect with the truths that fundamentally animate all of us.